City Gate Construction has announced another boost for the business after winning a major industry accreditation. 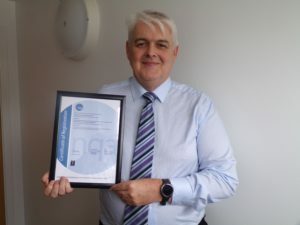 The construction company which has its headquarters in Renfrewshire with offices in Ayrshire and in England has secured ISO 14001:2015 – a much sought after Standard in environmental management. IS0 14001:2015 is an internationally-recognised Standard for organisations like CGC proving that it consistently provides products and services which meet the needs of customers. It is the second major ISO achievement for CGC. Almost exactly two years ago the business obtained ISO 9001:2015 – another industry achievement. The two accolades reflect the fast-moving expansion of CGC which works for high-profile customers including many councils, housing associations, plc’s and blue chip companies throughout the UK. Gary Tracey, Financial Director at CGC said obtaining the second ISO Standard marked another advance for CGC. The latest ISO standard focus specifically on aspects of CGC’s work including rot eradication, refurbishment of premises. steel manufacturing and repairs. Previous Previous post: WELL DONE SOUTH AYRSHIRE!